The first Great American Beer Festival, held in a small Boulder hotel ballroom in 1982, saw beers from around twenty breweries, whose numbers mainly included the few regional breweries still in existence, along with upstarts such as Sierra Nevada and Boulder Brewing. In the truest sense of, “if you build it, they will come,” a fast forward nearly three decades finds the GABF to have developed into the world’s largest beer festival, boasting 3,500 beers from 500 breweries. The grand daddy of beer fests, the GBBF too remains strong and still sets an enviable example for other events. The GBBF at Earl’s Court is a curious place where servers pour beers by the pint, in actual, proper glasses, and where many attendees stand around engaged in conversation while slowly enjoying their ales. To be sure, the GBBF suffers from some of the same issues that plague other fests, but seemingly to a lesser extent. While people still cheer when a pint shatters on the cement floor, no one tries to smack the glass from your hands as with recent GABF’s. There is also something remarkably adult about the GBBF’s format, where the larger vessels counsel visitors to slow down and really get to know their beers. And with bottles available for take away—and often at prices better than what we get in the states—GABF veterans can be forgiven their astonishment. But there are signs of change at the traditionalist GBBF as well. While the real ale booths remain well-attended, it’s the foreign bars, filled with American, Belgian, and German treats that truly pack in the crowds. Perhaps out of sheer novelty, the often unbelievable prices, or maybe as a palate bashing break from mellower British offerings, these beers remain in constant demand and disappear quickly. Starting with close to 100 casks and hundreds of bottles on the first day of the festival, which was mainly open to brewers and other members of the trade, nearly everything was ravaged by the end of day two. Plenty of thirsty, disappointed beer enthusiasts could be expected for the final two days of the event. Beyond the foreign bars, by far the most popular British beers at the fest had some sort of American connection. I watched the Colorado American IPA from Red Squirrel enveloped in a constant stream of pours until it kicked, all while dozens of other nearby traditional beers sat untouched. Similar scenes could be experienced across the hall with BrewDog’s Punk IPA. Where the IPA moniker once suggested stodgy, old beers your dad would drink, by the end of day two, attendees had killed every IPA at the fest, an incredible change of circumstances in only a few years. To be sure, hundreds of brilliant, traditional milds, bitters, and porters dominated the beer engines and the awards presentations. All the excitement of the fest, however, centered on the less established offerings and suggested that the future of British beer might not rest in campaigns to return to perceived glory days of old but in the splendor and whimsy of brewing innovation. As brewers at the GABF continue to experiment and push the definitions of beer and the boundaries of the drinking public, it’ll be interesting to see what results in the tug of war between the American and British brewing models in another twenty-five years. –Article appeared in Issue 43 of BeerAdvocate Magazine. Historian and writer Maureen Ogle has been posting a fascinating series of short pieces (cutting room floor bits from her book, Ambitious Brew) on the formation of the American Homebrewers Association and the Association of Brewers (which would later become the Brewers Association after a merger with the Brewers Association of America). Her most recent post focuses, timely enough, on one of the Association’s first industry-wide conferences. With the upcoming Craft Brewers Conference, and all of the articles I’ve been posting here about the Brewers Association, Maureen’s work is definitely worth a read as it provides an independent, outsider’s view of a trade group that we now take for granted. I look forward to discussing some of the issues brought up in these pieces (which, oddly enough, remain relevant to this day) with folks in town for the upcoming conference. For Charlie Papazian, founder of the Brewers Association, inspiration struck twice in remarkably similar ways. In the late 1970s, Papazian traveled to London, England, to attend the British Beer Festival. While sampling stouts, porters, and cask conditioned ales from around the United Kingdom, Papazian, an avid home brewer, started thinking about beer in the United States. When Papazian wondered aloud about whether Americans could host a similar festival, famed beer writer Michael Jackson famously quipped, “Yes, but where will you get the beer?�? A few years later, Papazian welcomed eight hundred attendees at the first Great American Beer Festival, offering them forty beers from twenty-two breweries. Fast forward two decades and travel to Italy, where local supporters of the Slow Food movement host several large international events dedicated to “good, clean, and fair food.�? Founded in 1986, Slow Food has grown to more than 80,000 members in 120 countries. As part of its mission statement, Slow Food espouses that “everyone has a fundamental right to pleasure and consequently the responsibility to protect the heritage of food, tradition and culture that make this pleasure possible. Our movement is founded upon this concept of eco-gastronomy – a recognition of the strong connections between plate and planet.�? It was in this environment, while enjoying wine and cheese pairings, that Papazian began wondering again whether such an event could work in the United States, only with beer. The resulting event, SAVOR: An American Craft Beer and Food Experience, was held May 16 and 17 in Washington D.C at the Andrew W. Mellon Auditorium. Tucked just behind the National Museum of American History, just steps from the National Mall, the auditorium provided a fitting and picturesque venue for an event that sought to elevate the public image of beer. Considered one of the finest classical structures in America, the auditorium was placed on the National Registry of Historic Places as part of the Pennsylvania Avenue Historic District on October 15, 1996. The event served several different purposes for the Brewers Association. SAVOR was the cornerstone event for this year’s American Craft Beer Week, which was held from May 12 to 18. Recognized by Congress in House Resolution 753, the event changed to a week long event in 2006. Celebrated annually, the week gives craft brewers a chance to highlight their industry and to promote their efforts. The event also gave craft brewers an opportunity to step up their legislative efforts on Capitol Hill. The Brewers Association, along with many of its top members, spent more than a week in the nation’s capital, where they attended the National Beer Wholesalers Legislative Conference and met with legislators from several states to press issues important to smaller brewers. As the culmination of their efforts, SAVOR gave craft brewers a chance to showcase their products to congressional staffers, many of whom attended the opening session on Friday night. Beyond politics and legislation advocacy, the event gave the association the opportunity to raise public and media awareness of craft beer by associating it with upscale food. SAVOR offered its 2100 attendees the chance to taste ninety six craft beers from forty eight breweries from around the country. Each beer was specifically paired with a sweet or savory appetizer selected by the brewery and made by Federal City Caterers. At eighty five dollars per ticket, the event was not an average beer festival for interested consumers. The price tag, which did not fully cover the association’s expenses for even the food portion of the event, was an area of concern for some brewers and attendees. Beer enthusiasts and well-heeled novices slowly roamed around the auditorium, stopping at the center table for the event’s main supporters, which included the Brooklyn Brewery, the Harpoon Brewery, Rogue Ales, and several others. Smaller breweries from around the country offered an eclectic assortment of beers at crescent shaped tables lining the outside walls. Late in 2007, the Brewers Association opened a lottery system for the selection of most of the forty eight slots for the event. While SAVOR offered many familiar names, including Avery Brewing Company and Deschutes Brewery, the association also sought to offer geographic diversity from some smaller names. These participants included the Blacfoot River Brewing Company of Helena, Montana, Free State Brewing of Lawrence, Kansas, and Heiner Brau Microbrewery of Covington, Louisiana. The pairings, which were offered either at an individual brewer’s table or from passing servers, included a number of interesting options. The Sprecher Brewing Company of Milwaukee, Wisconsin, offered its Pub Brown Ale to match pan-seared pilsener sirloin tips with shiitake blue-cheese sauce. Sierra Nevada Brewing Company of Chico, California, suggested its Summerfest Lager and lager steamed Thai turkey and shiitake dumplings. The Stone Brewing Company of Escondido, California, presented its Ruination IPA with either Peking duck purses or Christopher Elbow citrus spiced artisan chocolates. Despite the initial bumps and hurdles to be expected at a new event, consumer response to SAVOR has been generally positive. In keeping with the general theme of the event, the Brewers Association asked attendees to “dress to impress,�? which resulted in some interesting choices by beer enthusiasts, ranging from tuxedos to tuxedo t-shirts. Some attendees felt that the event was overpriced and complained about the relative scarcity of all the advertised pairing by the end of a session. Other attendees believed that SAVOR was underpriced considering the presence of otherwise difficult to find beers and the opportunity to speak with some of the most recognized small brewers in the country. One clear failure for the event was its SAVOR Salons, a forum in which brewers, journalists, and other beer luminaries spoke in smaller, tutored tasting sessions to attendees. The Brewers Association designed the salons to “deepen ones [sic] appreciation and understanding of beer and food pairings.�? The events included brewer Garrett Oliver pairing American artisan cheeses and craft beers, Boston Beer’s Jim Koch discussing how people can get started with beer and food, and Clipper City Brewing’s Hugh Sisson discussing the nuances of pairing beer with seafood from the Chesapeake Bay. Limited to approximately seventy people by the venue’s tight space, the salons were poorly marked and proved too popular for the auditorium. Originally advertised as first come, first serve, the association quietly switched to a ticket system. As people approached the forum before it was supposed to start, security had to bar their entrance to the room and explain that the salon was unavailable for attendance. The venue’s limitations, combined with the popularity of the offerings and the lack of communication, left many people disappointed by their inability to attend. Two years of preparing for the event left the staff of the Brewers Association, which is based in Boulder, Colorado, a bit strung out. The economics of the event are challenging and despite its popularity and its utility in promoting and improving the public image of beer among legislators and media on the East Coast, it is unclear whether SAVOR will be repeated next year. The association’s staff has also discussed the possibility of moving the event from the capital to New York City in future years. As part of its efforts to promote the public image of beer, Anheuser-Busch has also seen value in reconnecting beer with food. As part of its Here’s to Beer initiative, A-B hired ‘celebrity chef’ Dave Lieberman of The Food Network to host its Beer Connoisseur segment of its website. In this online video section, Lieberman teaches visitors about beer and about pairing foods with beer. The Here’s to Beer website (www.herestobeer.com) offers an excellent tool for consumers to select the best matches for their particular dishes or drinks. The site allows consumers to pick from dozens upon dozens of entrées, desserts, or cheeses, and the program will then suggest a recommended match, as well as a complementary and a contrasting match. The offered styles are then described in detail and suggest other food pairings. Alternatively, consumers can select the type of beer they are drinking and the program will suggest a suitable dish for pairing. The Here’s to Beer website also leads consumers on an educational tour of food and beer pairings, with storage and pouring techniques and how to start pairing food with beer. Anheuser-Busch has also taken its food and beer pairings into the real world. During its recent St. Louis Heritage Festival, a second annual event promoting the local brewers of St. Louis, Missouri, Lieberman also hosted a five course beer pairing dinner, along with brewmasters from the city. Lieberman has hosted similar dinners in cities around the country on Anheuser-Busch’s behalf. “Beer is one of the most versatile, moderate alcohol beverages in the world, and pairs well with a range of cuisines by complementing, and not overpowering, complex flavors,�? said Wertz in a press release. “Beer adds pizzazz to any menu and with Great Food Great Beer we want to help provide culinary enthusiasts with a fun, creative twist when preparing dishes. As detailed in the book, beer should be paired carefully with the right dish to bring out the best of both.�? While in the past most Americans have limited their idea of beer and food pairings to American light lagers and burgers, fries, and nachos, the increasing popularity of better beers, combined with the general consumer trend of trading up, has led to a radical shift in the popular perception of beer. Once cast away from the table and relegated only to life near the grill, flavorful beer is pushing forward to once again regain its place. On any given day in any major city around the country, consumers ranging from beer enthusiasts to complete novices can attend a beer dinner led by a brewer or interested restaurateur. Beer and food events can be found in package stores, where store staff or brewery representatives offer cheese and ale pairings. The opportunities to mix food and beer are only limited by the mind of the creator. When considering possible matches, try matching beers and foods that enhance one another and call specific attention to one or the other’s particular attributes. Consider the aroma, bouquet, and taste of particular beers and the accompanying flavors found in your selected foods. Great pairings need not always blend seamlessly and strongly contrasting selections can also provide an enjoyable and palate expanding experience. –Article appeared in June 2008 issue of Beverage Magazine. 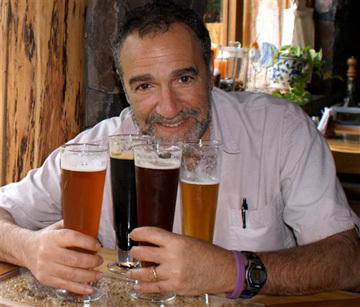 Media Draft – Is Charlie Papazian Trying to Put Beer Writers Out of Work? 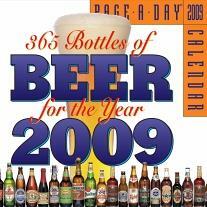 I was recently perusing the soon-to-be published titles list on Amazon the other day when I came across this little page on the 365 Bottles of Beer for the Year Page-A-Day Calendar for 2009. The ubiquitous calendar, which can be found on the desk of every beer lover and half the fathers in America, has long been written by writer Bob Klein. Klein, whose controversial Beer Lover’s Rating Guide: Revised Edition has been the subject of almost as many 1 star pans as 5 star praise reviews on Amazon, is sort of a mysterious figure in the beer industry. He wrote the guide, which was last updated in 2000, and the calendar and that was about all most beer enthusiasts knew about him. In all my travels in the industry, I’ve never met him, seen him, or know anyone who has met or seen him. For all I know, Bob Klein is Charlie Papazian’s nom de plume, which brings me back to my original point and the outlandish headline on this piece. Papazian’s name is well-known to beer lovers as the author of several books, including the seminal ‘Complete Joy of Homebrewing.’ He is also the founder and president of the Brewers Association, a trade organization which represents thousands of smaller American breweries. In his spare time, Papazian also writes magazine and newspaper articles for a variety of publications, including a bi-monthly column in Draft Magazine. From the Amazon release, it appears that Papazian has now taken over for Klein as the editor of the beer desk calendar. While I’m curious about how this came to be, a review of the publisher’s website (Workman) doesn’t provide much of an opportunity for inquiring media to contact the PR department. If I were the editor of the Celebrator or Ale Street News, I’d keep an eye over my shoulder. Charlie’s the kind of guy who apparently knows how to multi-task…. I look forward to seeing how his style and contributions shape the revised calendar. Cheers.